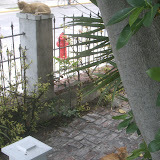 Miss Kitty and Little One are the two cats who live at the Real Key West Gallery. Captain Outrageous was a great animal lover. His dog JAR was instrumental in our meeting. Rommel, Peter Brawn's German Shepherd, was also the Captain's dog to care for. The cats love to just lay around and the scooter seat is a favorite spot for one or the other. The cats tolerate each other. Little One is younger and less people-friendly, while Miss Kitty will take some petting from humans. Another favorite resting spot for Miss Kitty is atop the mailbox. Crosby did a study of some Key West cats he met during his travels around town, especially the polydactyl cats who live at the Hemingway House. See all the photos at Picasa. I changed my mind. I love the paint job. It did look very different on the computer video.